Rugged and eerily beautiful, the property at the High Western end of the San Fernando valley, where the killers launched their bloody attacks, now stands empty and unmarked. The old Spahn movie ranch burned down in the 1970s, and the land remains undeveloped. Gone, too, is the Benedict Canyon house where the first night of slaughter occurred. Those who look for 10050 Cielo Drive—and many do—look in vain. It was demolished in the 1990s, and the Mediterranean villa that replaced it bears a different address. 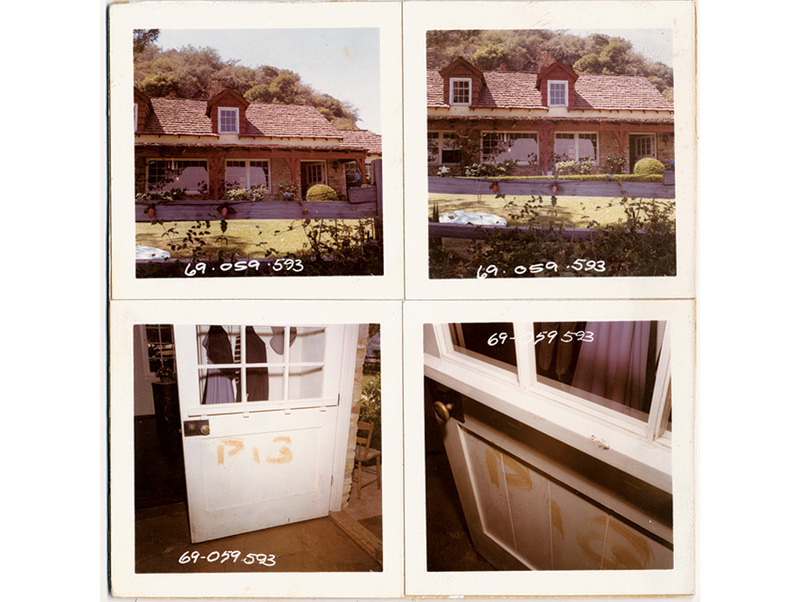 The hillside residence at 3301 Waverly Drive in Los Feliz, where the madness continued on the second night, is intact, but it also has a new street number. As for Barker Ranch, the desert hideaway to which the murderers fled, it burned this spring. Still, the events that transpired at these places have left an indelible scar on Los Angeles’s psyche. The murders, so bizarre, so arbitrary, could have happened only here. For 40 years the city has been haunted by the names of the victims, usually run together as Tate-LaBianca. It is important, though, to remember them as individuals. On the first night: actress Sharon Tate, 26, who had starred in Valley of the Dolls and was married to director Roman Polanski; hairstylist Jay Sebring, 35; Voytek Frykowski, 32, an old friend of Polanski’s from Poland; and Abigail Folger, 25, Frykowski’s sweetheart and heiress to the coffee fortune. Steven Parent, an 18-year-old delivery boy, simply happened to be there. On the second night: Leno LaBianca, 44, president of Gateway Markets, a small grocery store chain, and his wife, Rosemary, 38, who ran the clothing shop Boutique Carriage. 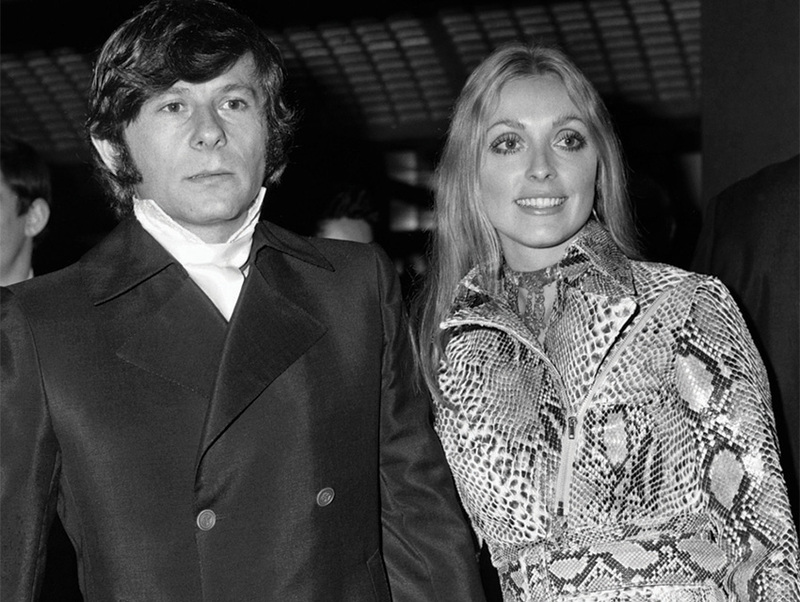 Polanski and Tate in London. On the first of two nights of carnage, Manson’s followers beat, shot, or stabbed to death five people, including the actress, who was pregnant. There is also, of course, another name, one that will likely outlast those of the dead. Charles Manson. There had been mass murderers before, and there have been since, but Manson is an enduring symbol of unfathomable evil. He transformed seemingly peaceful hippies—sons and daughters of the middle class—into heartless killers. Then he set them loose in Los Angeles’s most privileged neighborhoods. 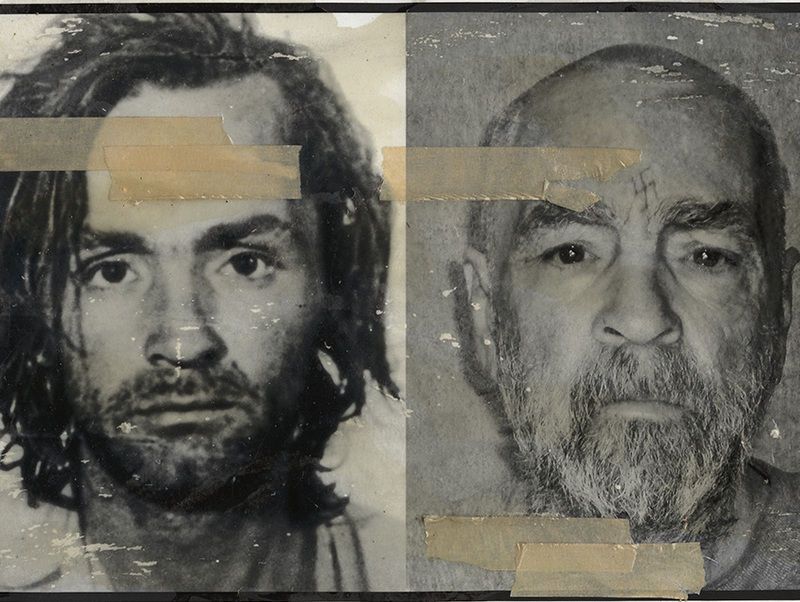 Even after all this time, mention of Manson frightens many who lived through the months of terror. Attempts to solicit information conclude, as often as not, with slammed-down phones. The senseless and intimate nature of the violation—men and women butchered in their own homes—is still too upsetting. Yet those who would talk (and many ultimately did) give voice to one of the most horrific events in Los Angeles history. The Manson case matters not only because of the magnitude of the crime but because it revealed the violent, predatory side of the 1960s. When Winifred Chapman, who kept house at Cielo, discovered the bodies just after 8 a.m. on August 9, 1969, any hope that the counterculture would be immune was shattered. The 1960s ended by degrees, but it was here that the ending began. MICHAEL McGANN, Los Angeles Police Department homicide detective. Seventy-three years old, he is retired. I arrived at the Tate property at 1:45 or 1:50 on the afternoon of August 9. There was a large gate that protected the driveway. There was a car parked in the middle of the driveway, and there was a body in the car. That was Steven Parent. He was slumped over to the side on the front seat. He’d been shot. As I approached the house I noticed that the word “PIG” was written in what appeared to be blood on the front door. Then I went inside. Sharon Tate and Jay Sebring were lying on the living room floor, both with multiple stab wounds. A rope was tied around Sharon’s neck and draped over a rafter. The other end of the same rope was affixed to Jay Sebring’s neck. They were probably about four feet apart. Sharon was in a bikini-style nightie. She was eight-and-a-half months pregnant, and I could tell she had been stabbed 15-plus times. Sebring had been stabbed and beaten over the head. There was blood everywhere. I went through the house and down a long hallway leading out to the back door where the pool was, and I went out into the lawn and found Abigail Folger. She was in a nightgown, and she’d been stabbed numerous times. Her gown was soaked in blood. Then a little bit farther on was Voytek Frykowski. He had numerous head wounds, like he’d been hit with some kind of object. He also had many stab wounds and had been shot several times. He was fully clothed, and he was covered in blood. In the space of ten minutes I saw all five bodies. I’d worked homicide for five years and seen a lot of violence. This was the worst. DANNY GALINDO, Los Angeles Police Department homicide detective. He is 88 and retired. When I arrived, there was a perimeter all the way around to keep the media out. They had their own camp and so much equipment. It was a circus. Reporters were cluttering the entry to Cielo Drive all the way to the street below. McGANN The whole crime scene was grotesque, totally weird. Steven Parent, the kid in the car—that made no sense at all. He obviously had nothing to do with the people in the house. But there was some promising evidence, and we tried to collect it immediately. We collected broken pieces of a pistol grip. We found a knife. I collected some phone wire. The killers had cut the line into the house, so I saved the piece they’d cut. We had our people from SID [Scientific Investigation Division] collecting blood. We collected fingerprints. Before we got there, the uniform officers had made an arrest. There was a single-story guest house in the back, and William Garretson was hiding in there. WILLIAM GARRETSON, caretaker at Cielo Drive. At 59, he is a big-rig truck driver. They were more or less convinced that they had the person who committed the murders: me. They took me across the lawn, and I saw three bodies—Abigail and her boyfriend and then Steve Parent. It wasn’t pleasant. Steve was an acquaintance of mine. Unfortunately, he’d come to visit me the night before to sell a radio. He left, and this happened. They arrested and fingerprinted me. They had me as the prime suspect, and they began playing head games—good cop/bad cop. I escaped death, and now I was going to be tried for something I didn’t do. GALINDO As the investigators gathered the evidence, I took charge of it. Among the items for gathering and preserving were a goodly amount of narcotics. Some pot was recovered from Jay Sebring’s vehicle. There was a book printed in Chinese depicting many forms of sexual satisfaction in very explicit terms. McGANN The deputy coroner took charge of the bodies. He took their liver temperatures to try to determine the time of death. He put the remains in plastic bags. As I recall, we removed Sharon and Sebring’s bodies first. Then we went to Abigail and Voytek. Steven Parent was the last body removed. GALINDO As everyone left, I was told to stay and guard the interior. I stayed overnight. I couldn’t find a good area to lean against or lie down on or relax against because of all the blood. I tried to find a spot at the front door, but it was too bloody. I tried to find a place inside, but when you opened the door, there was so much blood on the wall. I finally found a place in back and fell asleep. McGANN The next day, which was Sunday, we started the autopsies. The L.A. County coroner’s office was in the basement of the old Hall of Justice. It was like a dungeon—an awful place to be, like Frankenstein’s lab. But when you have a homicide, you always go to your autopsies. So I was there as Tom Noguchi did Sharon’s autopsy, then her baby’s. I had a temporary partner, Jess Buckles. As I was observing the autopsies, he got a call from the Los Angeles County Sheriff’s Department. They had a case in Malibu in which Gary Hinman, a musician, had been murdered. A guy named Bobby Beausoleil had been picked up for the crime. There were similarities between their case and the Tate killings. 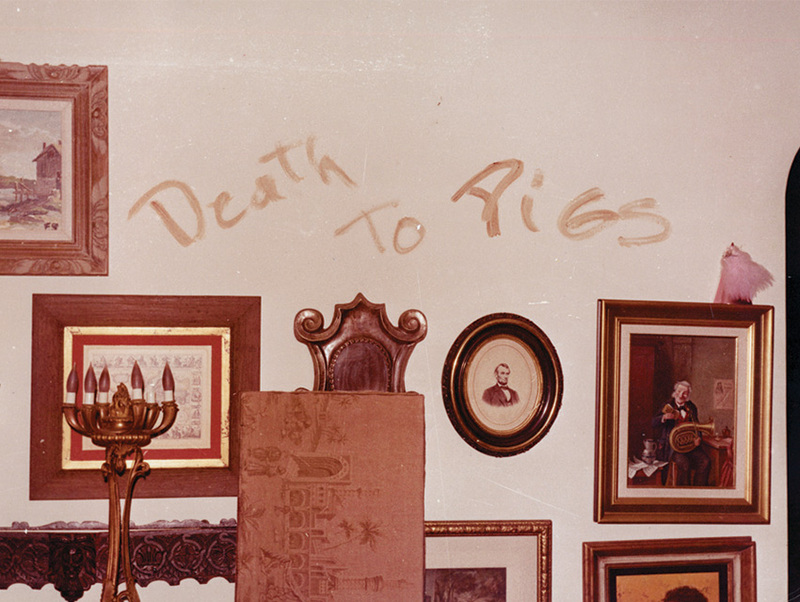 It was a vicious murder, and the words “POLITICAL PIGGY” had been written on the wall in blood. The sheriff’s detectives told Buckles about this, but Buckles didn’t see any connection. When I asked him what that was all about, he said, “It was nothing.” That was a screwup, a major screwup. Let me tell you, we would have solved the case in a month if I’d known about this. GALINDO The second night after the Tate fiasco, I was at the homicide division of Parker Center downtown typing reports. I got a phone call. It was a reporter from the police beat, and he said, “Danny, listen to this. You’re gonna get a call right now. They got another one of those bloody ones just like the one you’re working on. And there’s a knife stuck in the throat of the victim.” I hung up, and the phone immediately rings. It was the inspector. So I drove to Los Feliz. When I walked in, Leno LaBianca’s body was lying on the floor in front of the couch on the left side, and it was sitting in a huge pool of blood. The couch was full of blood. They bled him dry. I noticed that his head was covered with a pillow slip all the way down over his chest, and I’m thinking about the knife that’s supposed to be stuck in his throat. I couldn’t see it. Somebody on the premises—an ambulance crewman or another policeman—had seen something and leaked it. Rosemary LaBianca’s body was in the bedroom. She had fallen over the far side of the bed. There was a pillowcase over her head, too, and around her neck was an electric cord connected to a bed lamp that had toppled over—not, in my opinion, by a struggle but by Mrs. LaBianca pulling herself into a cavity between the wall and the bed. That’s where she died. She was on the floor, partially disrobed, and she had a lot of puncture wounds—turned out there were 40-odd wounds. She bled inwardly. She drowned in her own blood. On one wall in the living room, written in blood, it said “Death to Pigs.” On another wall, also written in blood, was the word “RISE.” Scraped into Leno’s stomach with a fork—a bifurcated fork—was the word “WAR.” The fork was stuck in his stomach. The word had been written while he was still alive, because he’d bled through the letters. In the kitchen, the words “HEALTER SKELTER”—with helter misspelled—were written in blood on the refrigerator. When the coroner took the pillow slip off Leno’s head, there was that knife plunged into his throat that the reporter had told me about. The press knew far more than the police wanted it to, but it didn’t know everything. No one except the investigators and the killers was aware that “Healter Skelter” had been written on the LaBianca refrigerator. That night I was interviewed by a television reporter. He pointedly asked me, “Do you think this case is connected to the other one?” He meant Tate. I told him, “I think it’s more of a copycat case.” I introduced that expression, and I’ve lived with it forever. It was a helluva mistake on my part, because it wasn’t until much later that things would begin to fall into place.